Hey, guys. 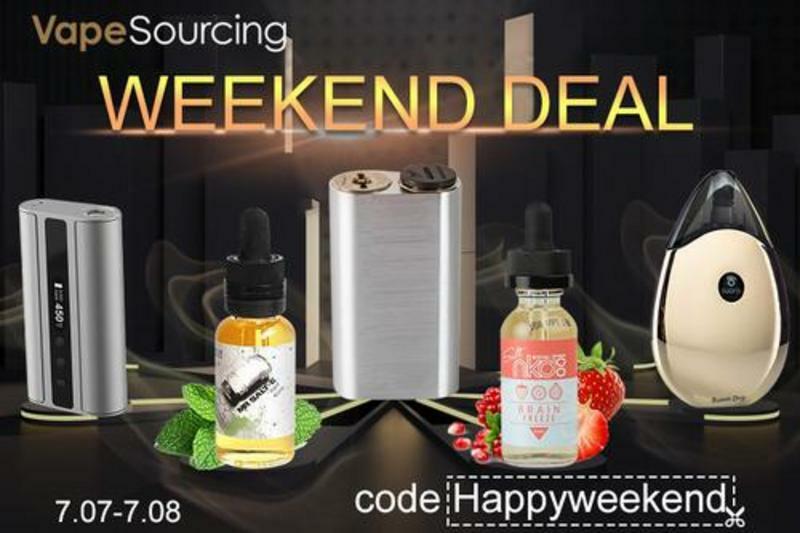 Vapesourcing now promote a weekend sale for you. 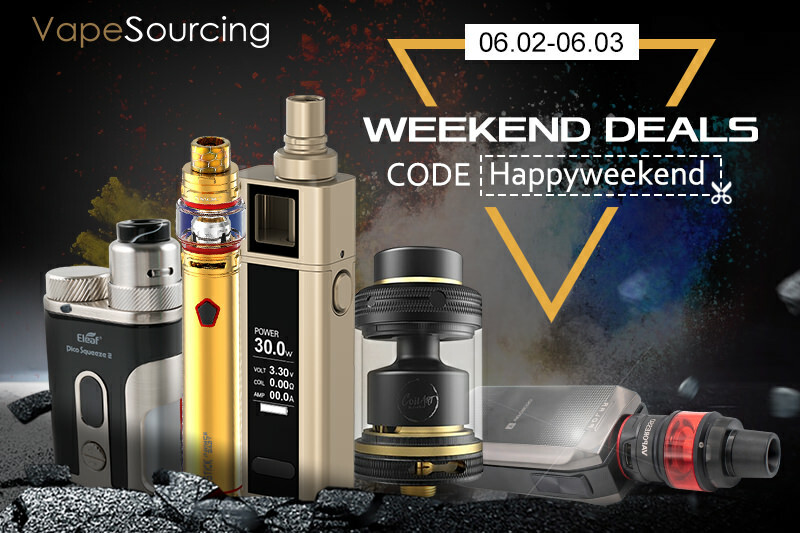 Use coupon code "happyweekend" if you buy products in https://vapesourcing.com/special-price/w...-deal.html, you can enjoy 10% off discount. Available between 5/12 to 5/13. Weekend sale again. the same coupon code "happyweekend", the same 10% discount, different products which can enjoy the discount. get them at https://vapesourcing.com/special-price/w...-deal.html, available between 5/19 to 5/20. 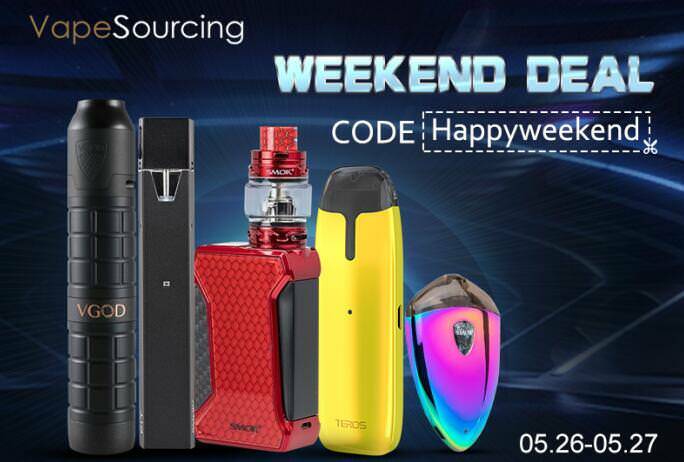 Hello, this weekend, Vapesouring update the new products which can enjoy this weedend deal, they are SMOK FIT Kit, SMOK Rolo Badge Kit, VGOD Pro Mech Series 2 Kit, SMOK H-PRIV 2 Kit and Joyetech TEROS Pod System Kit. If there has the vaping device which you like, you can use this coupon code! 10% Off discount. Available between 5/26 to 5/27. Hi, guys! When the weekend is coming, Vapesourcing choose the best vapes for Weekend Deal in advance. Once you use the coupon code: happyweekend, you can enjoy the discount for 10% off. Valid time from 6/2 to 6/3. The e-cigs in the weekend deal section are at the lowest price that you cannot believe it. 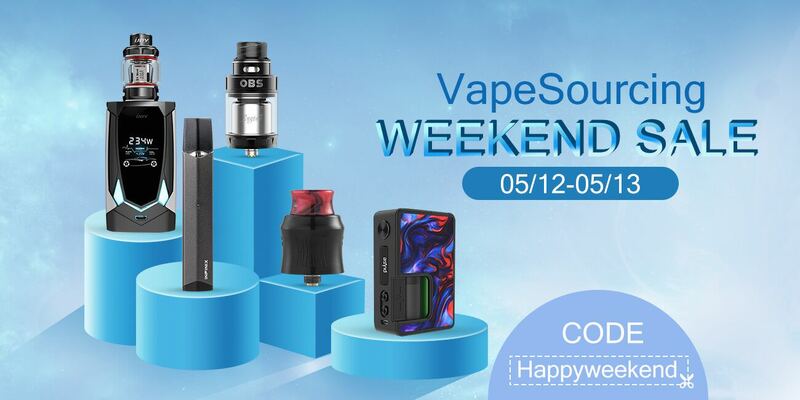 What’s more, Joyetech Cuboid Mini Full Kit not only can use the coupon code”happyweekend”, but also is for free shipping. SMOK Stick Prince Kit with TFV12 Prince is also chosen in this activity. If you want to enjoy the weekend sale on Vapesourcing, please click here: https://vapesourcing.com/special-price/w...-deal.html. Hi, guys! The weekend is coming again, and do you want to change your old vape device? Vapesourcing specially choose the hot sale products for you. Using the same coupon code: happyweekend, you can still enjoy the big discount for 10% off. 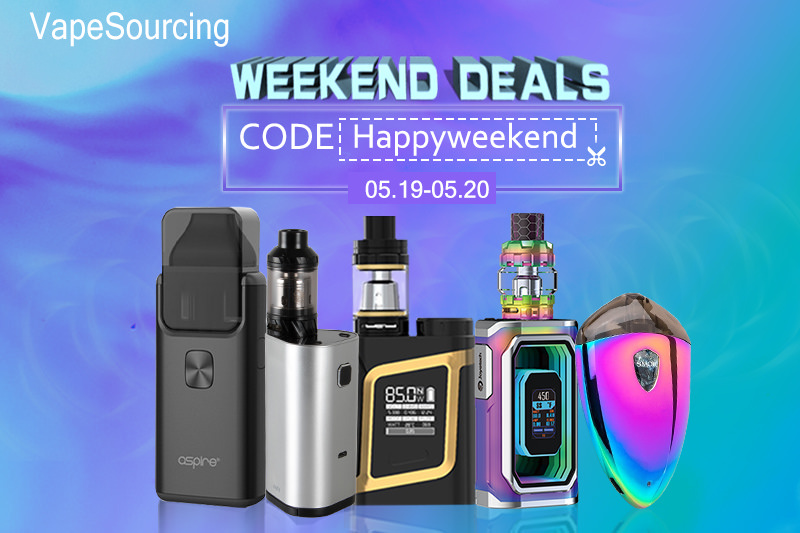 The following products: Joyetech TEROS Pod System Kit, Geekvape Ammit MTL RDA, Eleaf Lexicon Kit 235W with ELLO Duro Atomizer, SMOK MAG BABY KIT and Lost Vape Paranormal DNA250C Mod are choose in Vapesourcing Weekend Deal Section, so which one is your choice? Joyetech TEROS Pod Kit is also for free shipping, so don’t miss the chance. The weekend comes and it’s the time to enjoy your vaping time on the weekend! 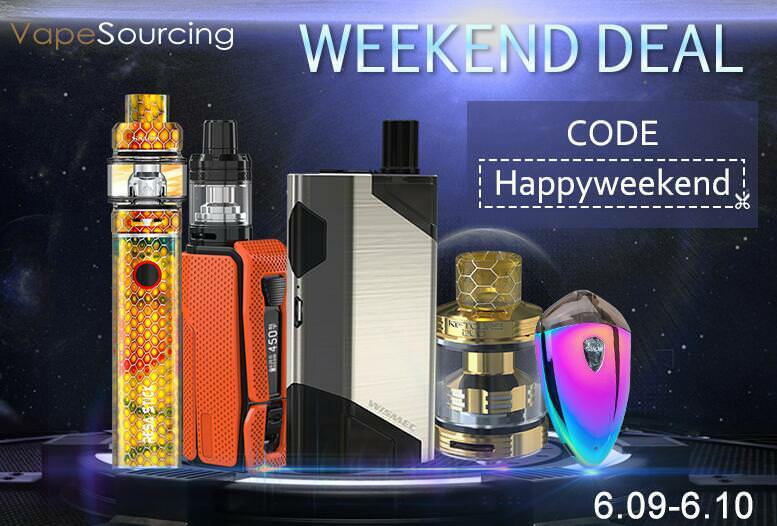 Vapesourcing still offer you the coupon code: happyweekend to enjoy the big discount for 10% off for Vapesourcing weekend deal. Vapesourcing choose the best vape device for you: Aspire Breeze 2 AIO Pod Kit, Eleaf iJust 3 Kit New Color Version, HQD Comma Kit All-in-one Pod System Starter Kit, WISMEC LUXOTIC NC Dual 20700 Kit 250W and Horizon Falcon Sub Ohm Tank Resin Edition, which are welcomed by vapers. You can choose the one you like best, so wich one is your option? This is the good chance to change your old vape device. And please enter here to get one: https://vapesourcing.com/special-price/w...-deal.html. 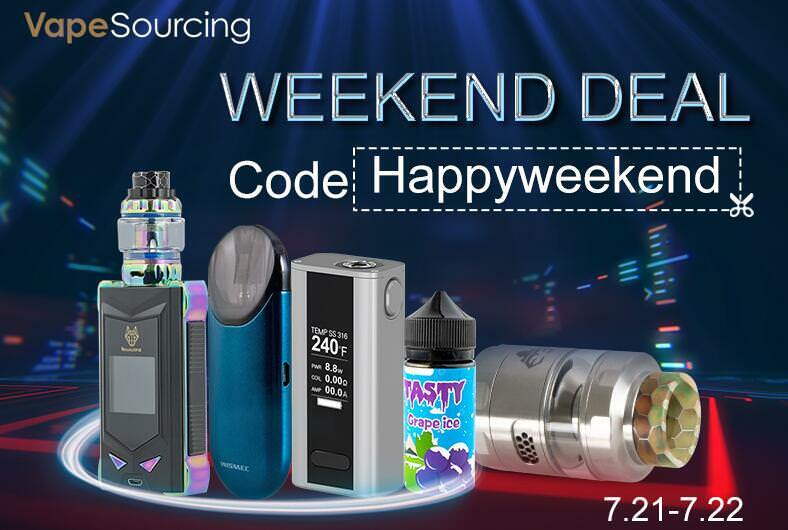 Guys, you will get the big discount every weekend if you go to the Vapesourcing Weekend Deal Section! Using the same coupon code: happyweekend, you can still enjoy the discount for 10% off. The following vape devices chosen for you at the lowest price: Suorin Drop Starter Kit 300mAh, Wismec Noisy Cricket Mod, Eleaf iStick TC 100W Kit, Mr Salt E Mint E-juice, NKD 100 Salt Brain Freeze E-juice, and all of them are in stock on Vapesouricng. Want to save your money, so you can click here to get the deals: https://vapesourcing.com/special-price/w...-deal.html. Hey, guys! 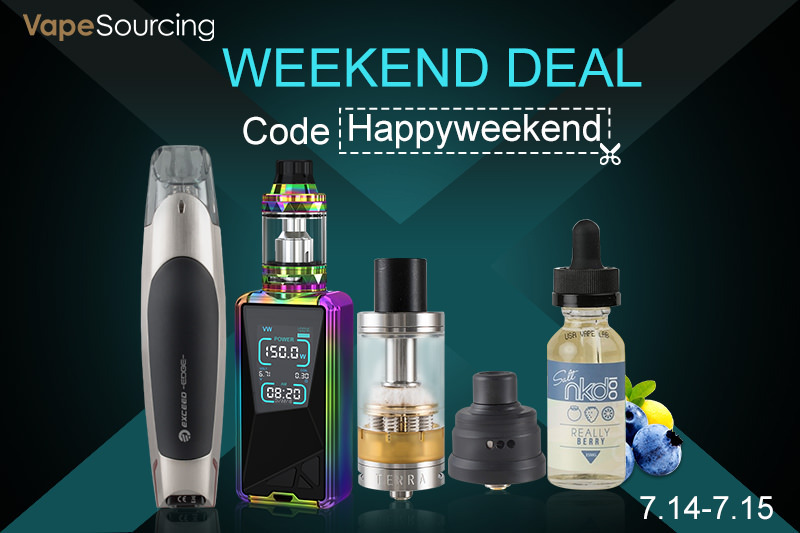 Have you already ordered the Vapesouring Weekend Deal vape devices for saving much more money? 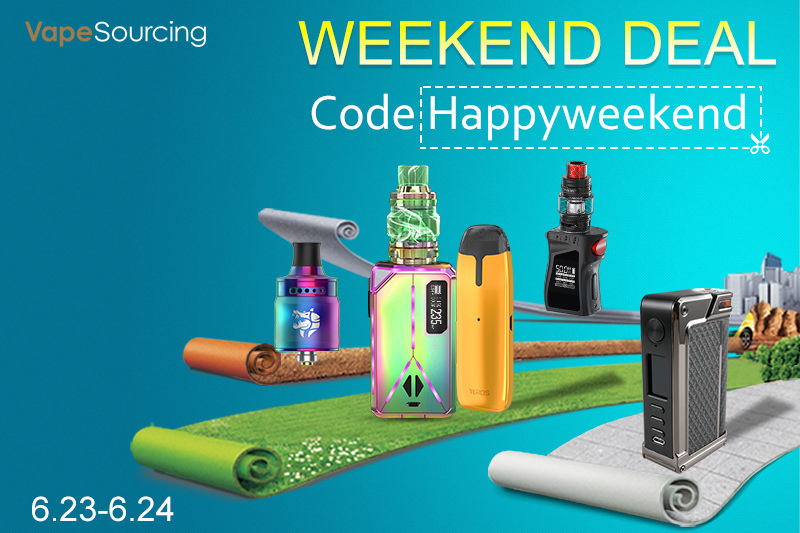 Here Vapesourcing still provide the coupon code: happyweekend every week for you to get the big discount. Valid time from 7/14 to 7/15. 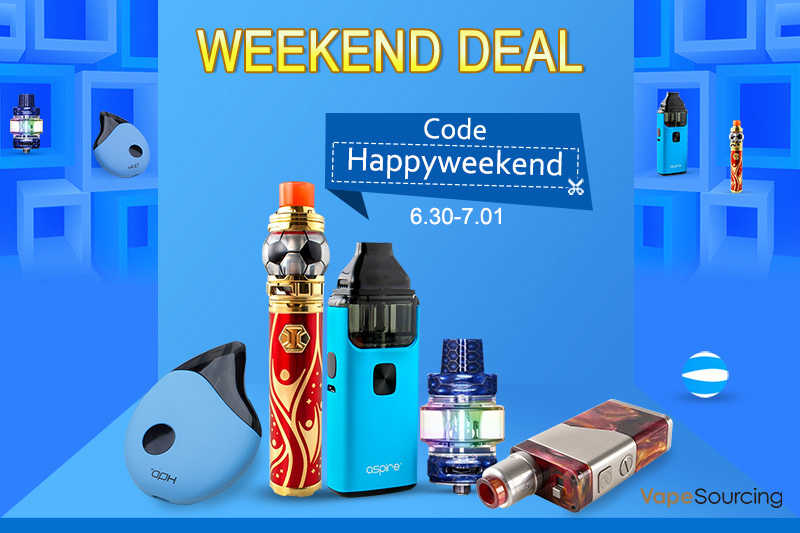 The following vape devices in Weekend Deal Section:Eleaf Tessera Kit 3400mAh, ENVII TERRA RTA, EXCEED Edge Kit, WISMEC Tobhino BF RDA and NKD 100 Salt Really Berry E-juice, so which one do you need now? And it's the time for you to order the newest vape device for enjoying your vaping time. Hi, guys! The weekend is coming again, and Vapesourcing still choose five best seller products for you. You can still use the coupon code:happyweekend to enjoy the discount for 10% off. Valid time: 7.21-7.22.